« The Drought Might Soon Be Over! Yep! The Drought Is Over! Yesterday was the first time we have seen the sun for several days! It was absolutely beautiful. Today we are having more of the same. Right now it is 66 degrees and sunny! Tomorrow is supposed to be partly cloudy and chances of rain later tomorrow into tomorrow night. Wednesday we might see scattered showers, especially early in the day. Thursday might be cloudy in the a.m. but sunshine in the afternoon. Friday and Saturday look nice with sunshine and upper 50s or low 60s. Glad to say not too great a chance for more rain. We don’t need it! Table Rock lake went up 8 feet in 7 days. Right now, they are running everything they have and keeping it from rising any more. Projection for tomorrow is more of the same….all four units going as maximum flow. the full run. 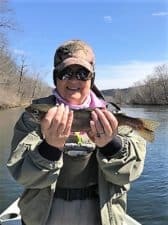 Picked a few fish from Trophy Run, down to Lookout Island, and on with the ruby 2 under either an egg pattern or the red tunghead size 16 midge. 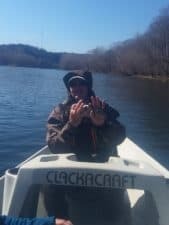 This entry was posted on Monday, February 26th, 2018 at 5:25 pm	and is filed under Fishing Reports. You can follow any responses to this entry through the RSS 2.0 feed. You can leave a response, or trackback from your own site.